This historic Carnegie library was experiencing serious degradation and interior leakage. The PL:BECS report provided detailed maps depicting all problem locations. To protect rapidly deteriorating terra-cotta elements, PL:BECS designed a double-layered flashing system of membrane underlayments capped with copper copings. Decades of weather exposure, combined with inadequate material selections, corroded all of the anchors securing the brick cladding to its hollow-clay tile structure, compromising seismic stability. 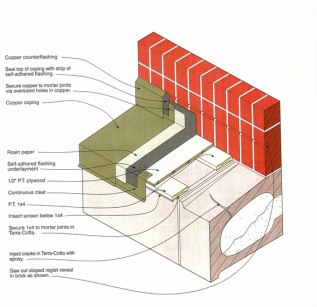 The PL:BECS report identified possible replacement anchors to re-secure the brick cladding. 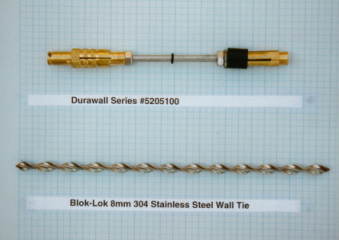 Field testing identified which retrofit anchors were best suited to the hollow-clay back-up structure. Project Summary:	This historic Carnegie Library, extensively remodeled in 1987, was experiencing numerous major leaks through sub-grade concrete walls, below roof scuppers, parapets, skylights, roof flashings, through exterior brick walls, and at other locations. Its exterior brick and terra-cotta masonry cladding was displaying extensive degradation. PL:BECS Services:	PL:BECS services have spanned over a decade, and included several different phases. The first phase consisted of analyzing the causes of the many leak problems and providing detailed corrective recommendations. This analysis revealed that many of the major leaks were introduced during the 1987 remodel, reflecting various design and installation errors related to skylight flashings and roof scuppers, removal of parapet copings, and similar ill-conceived measures. 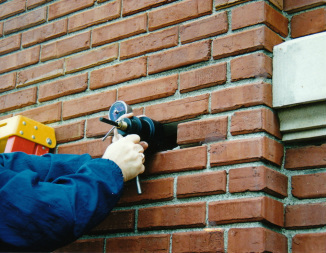 Additional problems related to condensation within a masonry chimney flue, degradation of masonry mortar and wood windows, cracks in sub-grade walls, corrosion of masonry lintels, and absence of masonry flashings. In the second phase, PL:BECS prepared detailed construction drawings and specifications describing corrective measures for the most serious problems, assisted with bidding, and oversaw the installation work to assure quality and performance. The work, which included new copper copings and flashings, epoxy crack injection, localized re-pointing of brick mortar and masonry restoration, EPDM flashings, slate roofing corrections, and similar measures, proceeded smoothly, eliminating the leakage. The third phase consisted of the evaluation of the anchorage of the exterior brick cladding to the primary hollow-clay structure and of the various exterior envelope elements. 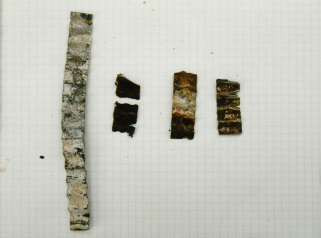 This uncovered extensive corrosion of the brick ties securing the cladding to the structure, inadequate masonry anchor densities, and continuation of the terra-cotta degradation, confirming the first study’s preliminary suspicions. 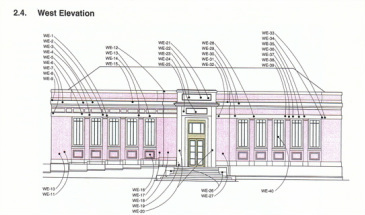 Fourth-phase services included preparation of detailed construction drawings and specifications describing extensive restoration of the brick and terra-cotta masonry. This work incorporated retrofit masonry re-anchorage, mortar re-pointing, installation of copper flashings, replacement of corroded steel lintels, and related measures. This masonry-restoration document package was integrated into a larger-scope project by SHKS Architects. During construction, PL:BECS assisted the architect with the evaluation of proposed masonry products. Services in the fifth phase consisted of the evaluation of the building’s original wood windows to determine which of these could be salvaged and which were too degraded, requiring replacement with new windows, custom-fabricated to match the existing historic profiles.